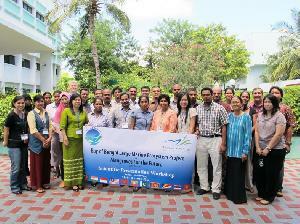 April 2013 - The BOBLME Project Steering Committee met in Chennai, India from 20 to 21 March. The PSC was well satisfied that the Project was on track; moreover, given projected savings in the budget, it instructed the RCU to request a one year, no-cost extension from the GEF to extend the Project completion date to 31 March 2015. The PSC welcomed the latest advanced draft of the Strategic Action Programme (SAP) , and endorsed the proposed institutional arrangements for SAP implementation which would consist of a Consortium of countries and partners. The BOBLME Project has been working closely with a range of bodies and organisations operating in the Bay of Bengal in order to improve coordination of activities and enhance impacts. The Bay of Bengal Programme Inter-Governmental Organization (BOBP-IGO), International Collective in support of Fish-workers (ICSF), International Union for the Conservation of Nature (IUCN), United Nations Environment Programme of the Global Programme of Action for the Protection of the Marine Environment from Land-Based Activities (UNEP-GPA), South East Asia Fisheries Development Center (SEAFDEC) attended the meeting (while WorldFish and the South Asia Cooperative Environment Programme (SACEP) - were unable to make it). The partners made a valuable contribution to proceedings and expressed their willingness to play an ongoing major role in the remaining BOBLME activities and future SAP implementation. 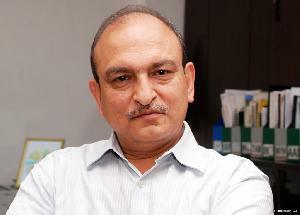 The meeting was masterfully chaired by Mr Tarun Shridhar, Joint Secretary of the Ministry of Livestock and Fisheries India (pictured), but sadly the PSC meeting was his BOBLME swan song as he moving from New Delhi to a new role with the State Government of Himachal Pradesh. We wish him all the very best! The PSC meeting report can be found here. Chair of The PSC, Ajith Silva, reviews progress and looks at the next steps, now that the Transboundary Diagnostic Analysis is complete. Implementation of policies turns out to be the biggest challenge - Policy directions workshop in Penang. January 2013 - The Chair of the BOBLME Regional Fisheries Management Advisory Committee (RFMAC), Mr Sinan Hussain from Maldives, presented the newly developed BOBLME fisheries status advisories of two key species that form significant fisheries in the BOBLME region, namely hilsa (Tenualosa ilisha) and the Indian mackerel (Rastrelliger kanagurta) to the 32nd Session of the Asia-Pacific Fishery Commission (APFIC) in Vietnam in September. 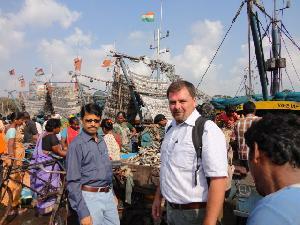 The Commission had previously asked the BOBLME Project to provide information to it on the Bay of Bengal fisheries. 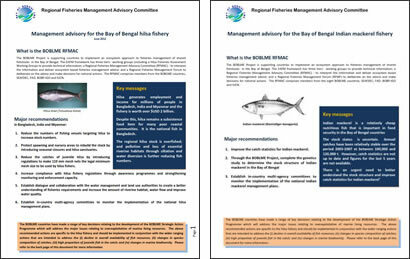 The Commission noted that the RFMAC advisories for hilsa and Indian mackerel included information on stock status, ecosystem impacts, socio-economics and governance, and agreed that the RFMAC advisory format was a good example of a policy advisory that was framed using the ecosystem approach to fisheries management, and that the format could be used by member countries in their national context. The Commission also noted that the advisories were useful for communicating broader information to policy-makers, over and above the more typical fishery science messages. You can down load the advisories here (as a flat pdf or flipbook). November 2012 - After months of editing, formatting and redesign, the BOBLME Project TDA has been finalised. The TDA identifies, quantifies and ranks the Bay of Bengal water-related environmental transboundary issues and their causes according to the severity of environmental and/or socio-economic impacts. This TDA draws on numerous studies and extensive regional and national consultations with stakeholders. A 'whats next' brochure has also been released to inform stakeholders about the steps being taken towards the development of the Strategic Action Programme that sets out a strategy for the countries to collectively deal with transboundary issues. The TDA (Executive Summary, Volume 1 and Volume 2) and the 'whats next' brochure are available in hardcopy (upon request); or you can simply down load them here (as a flat pdf or flipbook). October 2012 - This was one of the statements captured during the recent Regional Workshop on Policy Directions in Fisheries, Coastal and Marine Environment and ICM in the Bay of Bengal Large Marine Ecosystem (BOBLME) Countries, hosted by the Centre of Policy Research and International Studies (CenPRIS) and School of Biological Sciences, Universiti Sains Malaysia in Penang. 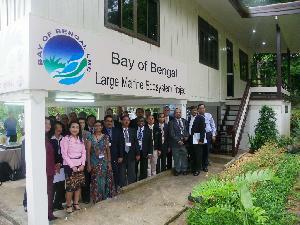 More than 30 delegates from government fisheries and environment agencies from eight countries, joined by national and regional experts from policy institutions, universities and NGOs, came together to discuss marine fisheries and coastal marine environment management policies as part of a programme of work organized by the Bay of Bengal Large Marine Ecosystem (BOBLME) Project. 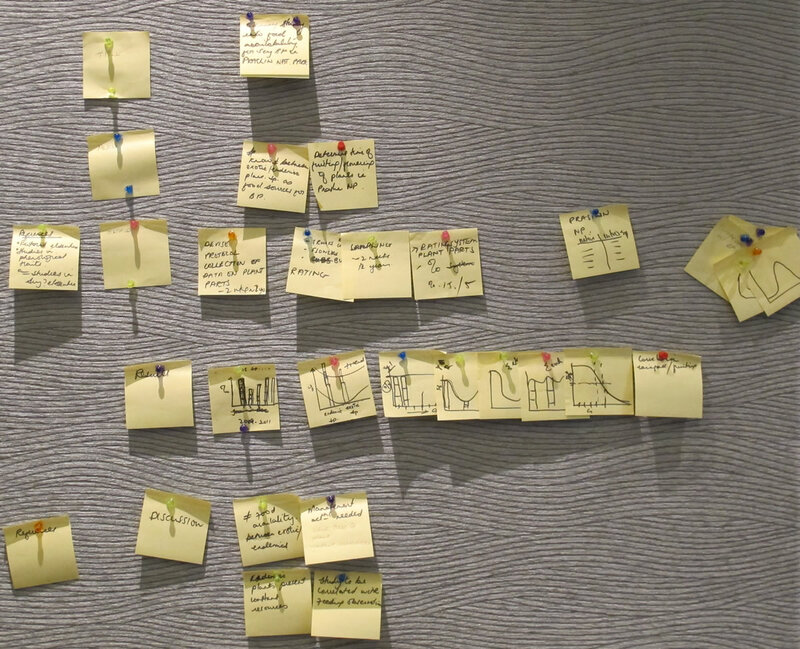 In 2011, the BOBLME Project had produced a draft regional analysis of policy processes, content and implementation for capture fisheries and coastal marine environment management; its finalization was the major objective of the workshop. Initial findings from the report indicated that there is good similarity between the main policies and management in the fisheries sector; and while countries can always improve their policy content, greater challenges may lie in implementing policy and in improving policy processes. The synthesis report was successfully validated and the updated finalized version will soon become available on the BOBLME website. The Regional Workshop in Penang also identified areas of policy needs and gaps and constraints in policy implementation in the cross-cutting themes of capacity development, knowledge management, and institutional strengthening. These will now be developed into a programme of work for harmonizing policies and strengthening policy making capacity in the Bay of Bengal region in order to better manage shared fisheries resources and coastal environments. 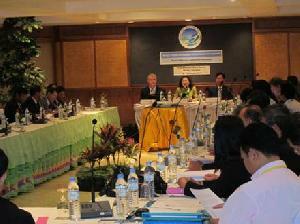 As in Myanmar and India, national TDA consultations have recently also begun in Thailand. A small team from the Prince of Songkla University’s Centre of Excellence for Biodiversity of Peninsular Thailand, led by Dr Sakanan Plathong, have been ‘on the road’ visiting all Andaman Sea coastal provinces. Most meetings were held at the Provincial Government Offices and attendances have been high. A wide range of stakeholders have participated, including provincial and local government officials responsible for fisheries and the environment, private sector and civil society representatives, economists, planners and other related sectors such as marine transport and ports and harbours. 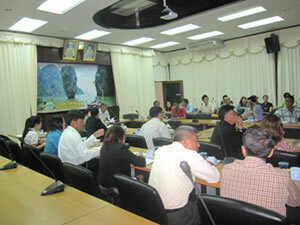 The purpose of these provincial consultations is to disseminate the contents of the TDA, and to review and validate the information and analysis it contains, in particular the important causal chain analysis which is used to identify underlying causes of key environmental and resources issues in order to prioritize them. The consultations are also useful to familiarize an increasing number of stakeholders with the work undertaken by the BOBLME Project and its expected outputs and outcomes. Issues raised by participants included the need for improved fisheries regulations and management, better access to information and the need for capacity development. Water quality issues have also been high on the agenda with concerns being raised regarding poor water quality at local, regional and transboundary levels. Water pollution from shipping and river run-off including sewage, as well as siltation caused by coastal erosion were of particular concern. In the case of Thailand, on balance, the issues raised during these consultations tend to confirm the analysis, findings and logic of the TDA and validate its suitability as the basis of developing the Strategic Action Programme to address these issues. A TDA (transboundary diagnostic analysis) identifies, quantifies and ranks water related environmental transboundary issues, and their causes, according to the severity of environmental and/or socio-economic impacts. The BOBLME’s TDA is the culmination of seven years of work, including numerous studies and extensive regional and national consultations held with stakeholders. The TDA provides the scientific basis for the collaborative development of the Strategic Action Programme that will formulate nationally and regionally coordinated activities to address the issues and their causes. 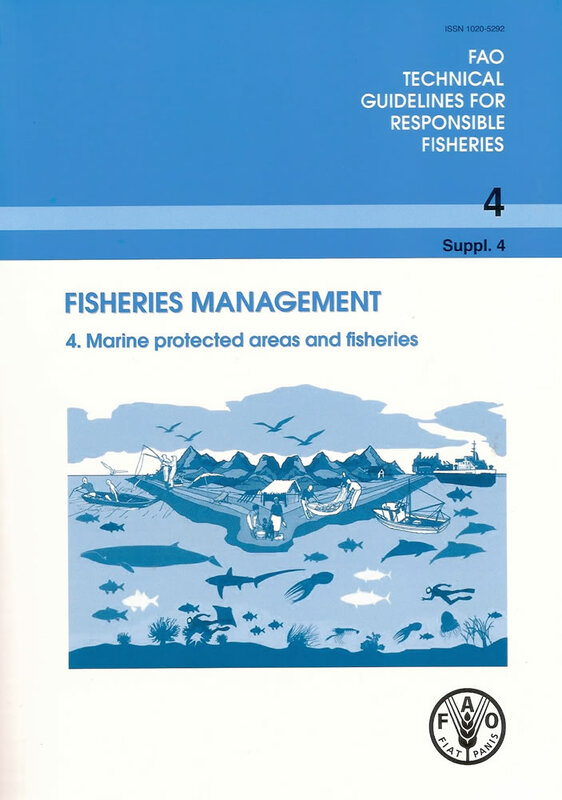 The establishment of marine protected areas (MPAs) or fish refugia can be an important management tool under the Ecosystem Approach to Fisheries (EAF) being implemented in the BOBLME. If designed well, MPAs can increase fisheries resources and conserving biodiversity. MPAs feature prominently in the work programme of BOBLME Project which is committed to develop better understanding of and promote a more comprehensive approach to the establishment and management of MPAs and fish refugia. A key activity in 2010 was the commissioning of a study to compile information on the status of MPAs and fish refugia in the Bay of Bengal. This compilation of information, including country profiles, was carried out by a team based at the University of Washington and was tabled at the recent Workshop on “the Status of Marine Managed Areas in the Bay of Bengal”. The workshop was organized and hosted on behalf of the BOBLME Project by the WorldFish Center in Penang, Malaysia from 18-19 January, 2011, and more than 30 participants from all BOBLME countries, resource persons from NGOs and also from FAO attended. Draft country profiles, covering information on MPA inventory, current status, MPA legislation and governance, threats and challenges, including socio-economic considerations and management effectiveness were discussed and validated. The workshop also agreed on the formation of a BOBLME MPA Working Group and made recommendations on implementing capacity development measures in pilot MPAs nominated by the partner countries. All eight BOBLME countries are signatories of the Indian Ocean-Southeast Asia (IOSEA) Marine Turtle Memorandum of Understanding. BOBLME has recently released its review of National Reports from the eight BOBLME countries, regarding their implementation of the IOSEA Marine Turtle MoU. This report was prepared by the IOSEA MoU Secretariat for the BOBLME Project. Aside from the assessment of country reports, with emphasis on interactions between fisheries and turtles, this review also analyzed information from IOSEA Site Datasheets regarding presence and abundance of species, threats, and remedial measures. The report concludes that all BOBLME countries have national conservation and action plans in various stages of implementation, and all use measures to minimize or reduce the mortality of turtle eggs, hatchlings and nesting females. Legislation for the protection of critical habitats exists, but there is still weak enforcement and monitoring. 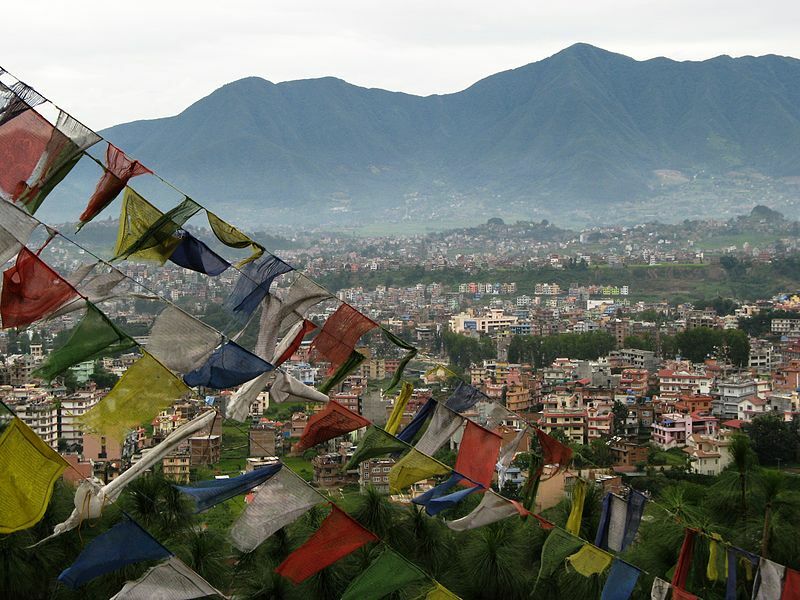 Capacity building and habitat studies were identifed as essential or key areas requiring international assistance, and these findings will become valuable input into the BOBLME Strategic Action Programme (SAP), now being developed. The BOBLME-IOSEA collaboration also resulted in the expansion of an online bibliography of turtle-related documentation for the BOBLME countries and the Western Indian Ocean. In the course of the work, over 1,300 citations were added to the IOSEA bibliography, most with abstracts, including 467 with linked PDF versions of the papers and reports. August 2012 - Participants at the recent the BOBLME - MFF Scientific Writing workshop in Phuket created storyboards like the one opposite to organise and design their paper. The BOBLME Project, in collaboration with Mangrove for the Future held its 2nd Scientific Writing workshop in Phuket, Thailand on 21-24 August. 16 young researchers from BOBLME and MFF countries participated. This was part of a two workshop programme on Communicating Science Effectively. The writing workshop is about organisation and taking a systematic approach to preparing and publishing a scientific paper. 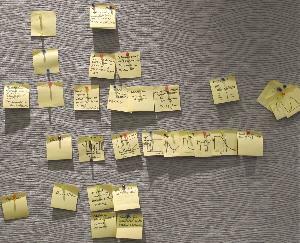 It was a learning-by-doing workshop with around 25% instruction time and the rest working on a real journal paper with support from peers and facilitators. At the end participants were expected to have a competed draft manuscript. 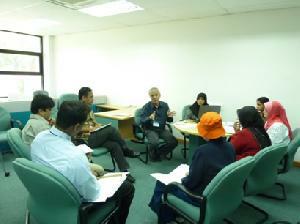 The BOBLME-MFF scientific communications programme comprises two 4 day workshops: the first on scientific paper writing and the second on scientific presentation (to be held 1-4 October, 2012). The workshops are designed exclusively for BOBLME and MFF focal country researchers seeking to improve their delivery of scientific and technical information/advice, and to be better equipped with the skills needed to communicate their work clearly and confidently to a wide range of audiences. August 2012 - A research paper by Myanmar scientists, looking into coastal water quality off Myanmar, throws light on some physicochemical properties of sea water in one of the BOBLME Project’s key transboundary habitats, the Myeik Archipelago. The research, undertaken in the course of completing the national report on marine pollution commissioned by the BOBLME Project, was conducted by 14 scientists, led by Prof Dr Kyaw Naing of the Department of Chemistry at Yangon University. The results have now been published in the Thai Environmental Engineering Journal Special Volume January-April 2012, under the title Some Physicochemical Properties of Sea Water in Tanintharyi Coastal Zone, Myanmar. 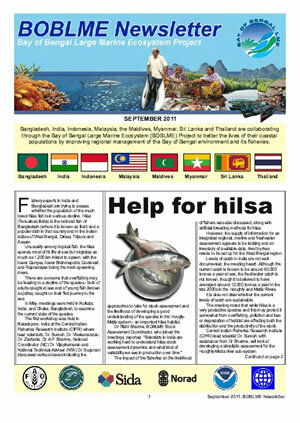 The full article can be read here, and the Myanmar Report on Marine Pollution is accessible here. BOBLME's mid-term assessment: How are we doing so far? Moves towards the standardisation of hilsa, mackerel and shark data. 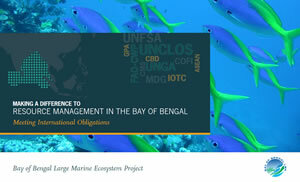 June 2012 - The BOBLME Project has published its latest brochure: Making a difference to Resource Management in the Bay of Bengal - meeting international obligations. 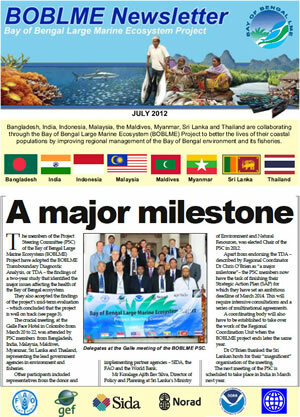 The brochure describes the activities being undertaken through the BOBLME Project and how the Project is helping Bay of Bengal countries meet their international obligations related to sustainable development, in particular, ecosystem based fisheries management. The goals and obligations being met though BOBLME relate to ASEAN-SEAFDEC, CBD, CMS, COFI, IOTC, MDG, UNCLOS, UNSFA, and UNGA, among others. The Regional Coordinator, Dr Chris O'Brien "hopes that BOBLME country delegations to international events will refer to this brochure when they report on their international activities in the future, and in doing so promote the excellent work they are undertaking through the Project." Click here for a copy of the brochure. 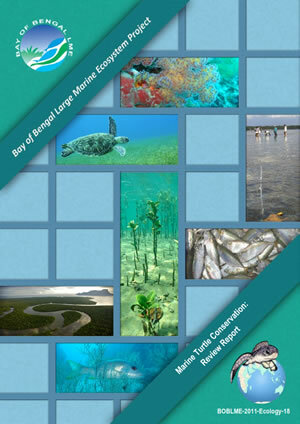 Hardcopies may be obtained by contacting the Regional Coordination Unit in Phuket, Thailand, by email to rcu@boblme.org. Regional coordinator Dr Chris O’Brien explained, “We are also becoming increasingly aware that there are work overlaps and, worse, duplication of work. “The meeting with partners aims to improve understanding of the resource management activities in the Bay of Bengal – past, present and future – and foster future collaborations, assist partners in making their funding go further and avoid duplication of work. January 2012 - BOBLME recently joined hands with the Southeast Asian Fisheries Development Centre (SEAFDEC) and the Food and Agriculture Organisation (FAO) to organise a workshop in Bangkok to disseminate recently published guidelines on Marine Protected Areas (MPAs). Delegates noted particularly that MPAs should be designed with fisheries objectives and benefits in mind. BOBLME Chief Technical Adviser Dr Rudolf Hermes pointed out that although this might seem obvious, it was often overlooked when protecting biodiversity was the main aim. He also noted that almost all MPAs are established within the coastal waters of a single country. After the main meeting was over, the BOBLME working group on MPAs stayed on for a further day of discussions on the implications of the FAO guidelines and to discuss how pilot MPA areas and projects might be supported through the BOBLME project. The 198-page FAO guidelines may be downloaded free here. BOBLME’s new essential facts brochure. November 2011 - The BOBLME project has recently initiated a review of the fishery data collection systems of its member countries. This review will provide information on sampling design and strategy as well as the institutional arrangements for data collection and implementation in each country. In other words, it will provide answers to the why, who, what, and how of fishery data collection and present these in a report that will facilitate cross-country comparisons and provide a regional overview. This will include a gaps analysis, identify strengths and weaknesses, identify best practices and recommend possible courses of action to be followed up by BOBLME and its partners. Carrying out the review on behalf of BOBLME is Dr Kim Stobberup, who is currently travelling around all eight countries. A Danish national, Dr Stobberup has extensive experience in data collection starting in 1994 when he spent three years at the Indo-Pacific Tuna Development and Management Programme (IPTP) in Sri Lanka. The IPTP was instrumental in preparing the conditions for the creation of the Indian Ocean Tuna Commission (IOTC). More recently, he has worked for the European Commission on improving fishery data collection systems in EU candidate countries such as Croatia. On the basis of his recommendations, BOBLME will support measures to enable the partner countries to improve their fisheries statistics, so that these can be used or relied upon for the management of their fisheries and resources. October 2011 - Twenty one people from the Asian scientific and technical community spent four days of October in Malé, in the Maldives, learning presentation skills in the second half of a two-part course on communications organised by BOBLME and Mangroves for the Future (MFF). The first part, which covered the organisation and writing of compelling papers, was held in Phuket, Thailand, in August (see Workshop teaches effective writing of scientific papers, below). In Malé the aim of this course was to “enhance effective communication of the results and progress of BOBLME and MFF projects to stakeholders and the broader scientific community through oral presentations”. This was a more daunting challenge than the one posed in Phuket; in this case, participants had to stand in front of an audience to deliver their presentations. Each presentation was captured on video as an aid to review. The course also covered the making of posters and responding to questions from the press. 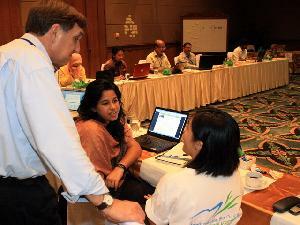 Dr Peter Rothlisberg, formerly of CSIRO, taught both the Phuket and Malé courses, assisted by mentors Dr Sevvandi Jayakody (from Sri Lanka); Dr Zelina Ibrahim (Malaysia); and Dr E Vivekananadan (India). A report on how Puducherry in India is moving ahead with an ICM project involving all levels of society. We hope you will enjoy reading the newsletter. Please let us know what you think of it. August 2011 - Twenty scientists and technical people from nine countries recently spent four days in Phuket, Thailand, learning the art of writing persuasive scientific papers. Running the four-day course was Dr Peter Rothlisberg, formerly Chief Scientist and Research Fellow in the Division of Marine & Atmospheric Science of Australia’s Commonwealth Scientific and Industrial Research Organisation (CSIRO). The curriculum was based on that used by CSIRO and Universities in Australia to increase the numbers and quality of publications produced by staff and students. “No one knows your data better than you do,” Dr Rothlisberg explained, “but you must recognise that you have to meet certain expectations of the people reading your paper. The Phuket workshop was the first of two. The second, which will be held in the Maldives in October, will concentrate on how to present scientific papers to an audience. “We’ll spend two days building the talk, and then two days presenting before the cameras,” Dr Rothlisberg said. The workshop was organised and underwritten by BOBLME and Mangroves for the Future. 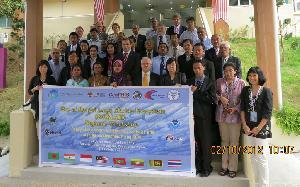 September 2011 - A postgraduate certificate course on integrated coastal management (ICM) opened on September 2 at the Asian Institute of Technology (AIT) in Bangkok. 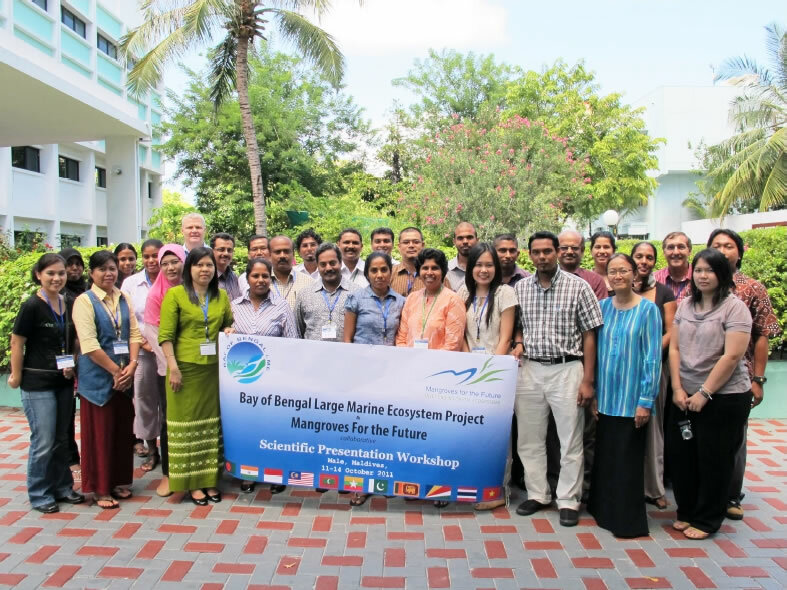 The five-week course attracted almost 40 participants from Bangladesh, India, Indonesia, Malaysia, the Maldives, Myanmar, Pakistan, the Seychelles, Sri Lanka and Thailand, all sponsored by either the BOBLME Project or Mangroves for the Future (MFF). The course is part of the commitment by BOBLME, MFF and AIT to address the growing need for qualified coastal practitioners. It aims to build a strong cadre of coastal managers and policy makers with the knowledge, tools and skills to design and implement sustainable ICM programmes for countries in the Asia region. The curriculum provides students with theoretical and practical knowledge on ICM, and the main coastal and marine ecosystems in the Asia region. Tools and skills for ICM will also be taught, with emphasis on designing, implementing and monitoring projects that integrate across sectors, involve diverse stakeholders and give consideration to the effects of climate change. The course consists of four taught modules, on marine and coastal ecosystems; principles of ICM, tools for ICM; and coastal project management. It will be followed by a 90-hour home-based assignment, including fieldwork, on coastal management and evaluation. Safe now: A blacktip reef shark, photographed in the waters of the Maldives. The announcement of the ban drew applause when it was made at a meeting of the Sharks Working Group from July 5 to 7 in Malé, capital of the Maldives. There was a great deal of enthusiasm from shark experts to return home and submit concepts for following the Maldives’ lead. May 2011 - Representatives from six of the BOBLME countries attended a regional consultative workshop of the Asia Pacific Fisheries Commission (APFIC) at the end of May in Kathmandu. The workshop was aimed at tackling the limited efforts undertaken so far to address the effects of climate change on capture fisheries and aquaculture in APFIC’s member nations. BOBLME was represented by K. Arulananthan from Sri Lanka, Mohd Lokman Husain from Malaysia, Hussain Sinan of the Maldives,U Myat Than Tun from Myanmar, Praulai Nootmorn of Thailand and Yahia Mahmud of Bangladesh. Specific aims of the panel were to improve understanding of the implications of climate change for fisheries and aquaculture; to collate national and regional reports relating to adaptation and mitigation; to create a regional review of known and potential implications of climate change; and to make a set of recommendations for action at regional and national levels. Ultimately, the aim was to come up with an overall action plan with options for adaptation and mitigation in the region. Specific recommendations to FAO, APFIC and Regional Organizations to support improved integration of the sector in climate change planning. These recommendations, it was decided, would be promoted in inter-governmental forums. The Medal, which is awarded every two years, goes to a person or organization “that has served with distinction in the application of the Code of Conduct for Responsible Fisheries”. The NACA serves as a cohesive intergovernmental forum for the formulation of regional policies as well as cooperation and coordination in aquaculture research, development and training. It has made significant contributions through its work on environment and aquatic animal health, support for small-scale fish farming, promotion of better management practices, and aquaculture certification. 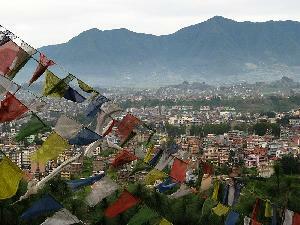 As a result of its successes, the NACA’s model is being emulated in other regions. “The contribution of the NACA to application of the Code is … outstanding, practical, tangible and sustainable as well as catalytic for other regions to follow,” The FAO medal citation stated. The Medal pays tribute to Margarita Lizárraga, Senior Fishery Officer, for her decisive role in promoting the Code of Conduct for Responsible Fisheries. 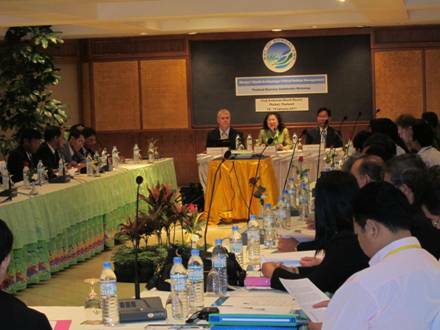 The 2nd Meeting of the BOBLME Project Steering Committee (PSC) took place from 29 – 31 March 2011 in Phuket, Thailand. 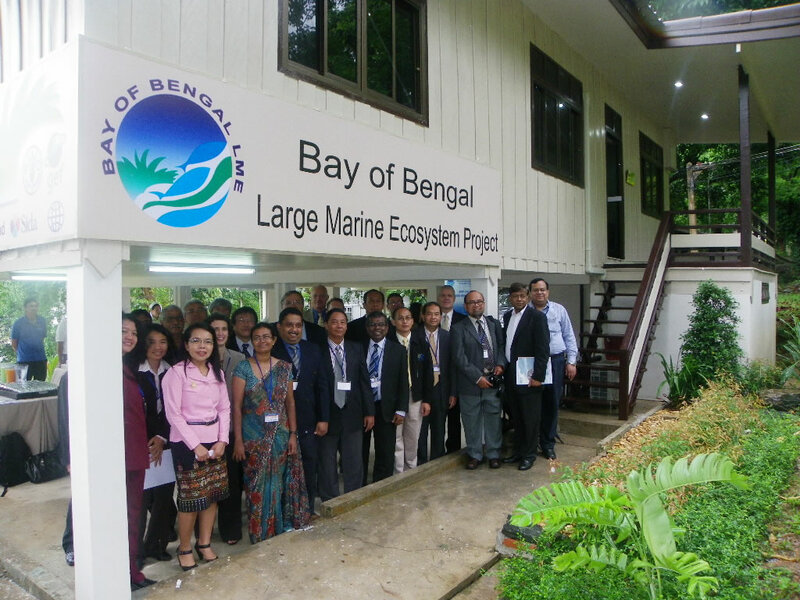 The meeting was attended by 16 participants from the Project Partner Countries Bangladesh, India, Indonesia, Malaysia, Maldives, Myanmar, Sri Lanka and Thailand, representing the lead government agencies in environment and fisheries. Other participants included representatives from the donor and implementing partner agencies NORAD, SIDA, NOAA, and FAO. Before the meeting proper, the new offices of the BOBLME RCU on the premises of the Andaman Sea Fisheries R&D Center of the Thai Department of Fisheries were inaugurated by Mr Pongpat Boonchawong, Senior Expert on Fisheries on behalf of the Director-General, Department of Fisheries, and Mr Hiroyuki Konuma, the FAO Assistant Director-General and Representative for Asia and the Pacific. The offices have a floor space of approx. 140m2 and overlook Makham Bay in the southeastern tip of Phuket Island, not far from the deepsea port and the Phuket Marine Biological Center of the Department of Marine and Coastal Resources. The inauguration session was followed by the actual PSC Meeting, held at the nearby Radisson Hotel. It was opened by the out-going Chair, Mr Shamsul Kibria from Bangladesh and then elected Mr Pongpat (Thailand) for the current session. Major topics of the first day of deliberations were the presentation and endorsement of the 2010 Annual Work Plan and discussions of matters concerning Project implementation, such as co-financing, raising of awareness levels on BOBLME among policy makers, promotion of the Ecosystem Approach to Fisheries, and the increasing importance of the roles of BOBLME National Coordinators. On Day 2, the PSC examined in detail the activities proposed in the 2011 Work Plan, and the related budget for each of the more than 100 outputs to be achieved. Many of these relate to National and Regional Workshops of training events, and the reports resulting from these. Key areas of particular importance during this year include the finalization of the national consultations on the Transboundary Diagnostic Analysis (TDA) and its adoption in the 2nd half of 2011. Preparatory activities for the drafting of the Strategic Action Programme (SAP) will also begin in 2011, with the formation of SAP Teams and their first working sessions. Further highlights of the 2011 Work Plan, which was subsequently adopted by the PSC, include the formulation of ecosystem-based fisheries management advice and the intensification of work on transboundary critical habitats in the Mergui/Myeik Archiepelago and Gulf of Mannar. Monitoring and Evaluation was discussed under a separate agenda item, recognizing its purpose and requirements as a management tool and noting the comprehensive information provided in the various monitoring reports prepared routinely. Preparation for a Project Mid-term Evaluation, to take place in late 2011 or early 2012 and capacity development in M&E are major activities in 2011. The PSC congratulated and thanked the Chairman and host country Thailand for facilitating the 2nd PSC Meeting and for providing the very suitable facilities for the BOBLME RCU. 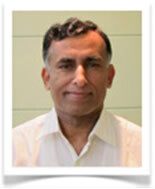 The PSC agreed to hold the 3rd meeting in March 2012, tentatively in Sri Lanka. The BOBLME Project National Coordinators and National Technical Advisors assembled in Phuket on 9-10 February for a two day workshop to draft the 2011 work plan that included a range of studies, training, research meetings, and the forthcoming responsibilities for each member county participating in the Project. 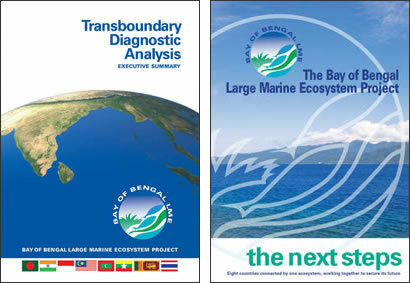 A major goal of the Project is to improve understanding of the Bays’ ecosystem and the processes affecting it; foster collaboration and knowledge sharing; and to harmonize the policy and management approaches in the eight countries that share it. The BOBLME Project is strengthening the capacity of the countries to continue this work into the future. 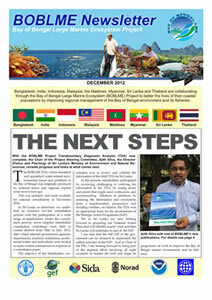 Once the overall work plan is designed, each National Coordinator and National Technical Advisor will play a pivotal role in the design and implementation of the work in their respective countries. . A wide range of work is proposed for 2011, including a major review of current policies and development of a plan for policy harmonization; better understanding of the biology and stock status of hilsa and Indian mackerel; support to better implementation of National Plans of Action on shark conservation; and contributing to the ocean observation system in the Bay to gain a better understanding of processes governing its productivity and influencing the climate. The next step in the process is for the Project Steering Committee to review the work plan and the associated budget at its forthcoming meeting in March. Each National Coordinator will have different challenges in implementing the work plan, because of differences in the way their governments operate, different government priorities and cultural underpinnings. Yet improving the health of the Bay of Bengal is a shared concern, transcending such differences. In a progressive move, the National Coordinators agreed that they should meet more regularly to discuss progress, exchange ideas and build a more cohesive and collaborative approach to the work of the project. Government officials, scientists and representatives of non-governmental organizations from Thailand and Myanmar met late last month at the Club Andaman Beach Hotel in Phuket, Thailand to discuss the joint management of the Mergui Archipelago (also known as the Myeik Archipelago in Myanmar). The Mergui Archipelago is a unique area about one hundred times the size of Phuket that transcends the western borders of Myanmar and Thailand, from the Similan Islands in Thailand north to beyond the coastal town of Mergui in Myanmar. It contains some of the most highly productive fishing grounds in the Bay of Bengal, and world class reserves of coral reefs, sea grass beds, and old-growth mangrove habitats. In addition to these critical habitats, the area is characterized by a large number of rare and endangered species, such as marine turtles, sharks and rays, and marine mammals. The Archipelago is also home to the famous Moken People – the so called sea gypsies who live on boats and lead a nomadic lifestyle among the islands. Given its rich biodiversity, the Mergui Archipelago is coming under increasing pressure from urban development, tourism and fishing. And of course it is not exempt from the impacts of climate change and rising water temperatures that are contributing to coral bleaching in some areas. The Phuket workshop was the third in a series of meetings facilitated by the Bay of Bengal Large Marine Ecosystem Project (BOBLME). At conclusion of the workshop, the officials agreed to form an executive committee, comprising the government agencies which have mandates in the region to govern and regulate resource use; a multi-stakeholder advisory group to assist the committee in its deliberations; and a series of working groups to pull together information and undertake various analyses. The executive committee is expected to meet again later in the year. In the meantime a programme of data collection, review and analysis, involving a wide range of government bodies, universities and non-government organizations will start soon. The goal of the activities is to inform management and improve governance that aims at the balancing of sustainable resource use and social well-being.